It sounds pretty straightforward. 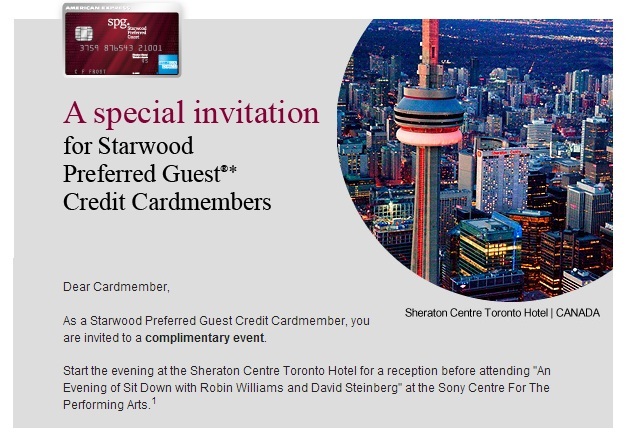 Call Amex Canada, and get a free event just for being a cardholder! Has anyone else gotten the email? The rest of the email says that there are only 15 seats, so call now. Based in Vancouver, I can’t take advantage of this, but some can’t. And if you can’t, you should apply for the SPG Amex. I’ll have a post soon detailing why it’s the best credit card in Canada for everyday spending.